An MRI or x-ray: which is better? Today hardly will be though one person who never did an x-ray. This is an old and proven method of examination used in our country for decades. Along with it, many have heard about the MRI as the advanced and highly accurate method of diagnosis. As often as is necessary, to resort to MRI does not allow its high cost. Naturally the question arises: so what can we do better – an MRI or x-ray? Let’s look at what is harmful and what is safer and what is the difference between them. Despite the fact that many patients consider MRI and x-rays interchangeable studies, between them there is a significant difference in the very physics of the method. MRI uses magnetic properties of tissues saturated with hydrogen, and x — ray is «photography» opaque structures using x-rays. The concept of «x-ray» implies a radiation dose to the patient. And if to compare these two methods from the point of view of security, the MRI clearly wins. Often patient complaints are so vague and typical of many diseases of the spine, the doctor has to diagnose almost blindly. This applies, for example, the complaints of the patient for pain or headache. Because of the fact that just back pain can be the consequence of a huge number of pathologies of the spine. Usually, if the doctor no longer has any data that indicates in which direction he should move, he begins with more budget and non-specific method of inspection – radiography. The advantage of x-rays before the MRI examination of the spine in that it clearly shows the overall structure of the spine, especially the bone structure, the bone density in General. If the x-rays of the spine revealed nothing, it is probably best to do an MRI, which visualizes the layers of all regions of the spine, structure of the vertebrae, intervertebral discs, the condition of the surrounding tissues. 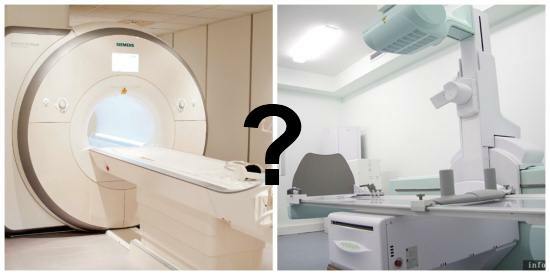 Deciding which is better – x-ray or MRI, you need to consider what to explore. If violations are associated with traumatic injuries and deformities of the spine, prescribe x-rays. For the diagnosis of soft tissue and tumors of the spine MRI is preferable. It would seem, due to its high accuracy in the diagnosis of different pathologies, magnetic resonance imaging will soon displace the old methods of research. But there it was! Radiography also has advantages over MRI. Today it radiography is the main method of recognition of pneumonia. It better visualizes the distribution process, sharp changes in roots of lungs, diaphragm, pleura, and also helps to detect complications. Using x-rays to monitor the effectiveness of prescribed treatment. Radiography is still indispensable for leaky atypical pneumonia that can be caused by Mycoplasma, chlamydia or Legionella. It is also shown in the so-called hospital-based pneumonia, which developed in patients after artificial ventilation of the lungs or operations. If radiographic study was conducted properly, it allows you to recognize all acute pneumonia. Therefore, it becomes clear why doctors resorted to radiography for the diagnosis of pneumonia. Due to the low cost of imaging, it is possible to resort repeatedly during the entire period of the disease. What is the required period of time after x-ray, to without consequences to go for MRI scan? What to do if you have a referral for both studies? Is it possible to do magnetic resonance imaging and x-rays in one day to be diagnosed quickly? Need! Since MRI does not give the patient radiation exposure, no one will forbid you to do two studies on the same day. It does not matter whether you are going to do an MRI prior to x-rays or Vice versa. However, we must remember that MRI takes 30 to 90 minutes, so you should agree on a timetable of research so as not to be late. So what method is in charge? Magnetic resonance imaging and radiography are different from each other and are not interchangeable research. Each of them has its own indications and the decision about what study to do better the doctor accepts. Don’t need to do a more expensive MRI scan if for measuring and monitoring your disease enough radiography. But it is not to underestimate the capabilities of MRI or to spare money on it, if there’s a reason that you appointed him. In diagnostic medicine, there are two concepts: overdiagnosis and underdiagnosis, the players are not the best role in identifying diseases. Underdiagnosis in which the doctor instead of assigning magnetic resonance imaging recommends that you x-ray does not show the true cause of the disease. And over – the doctor prescribes an MRI, when you can and should do with an x-ray. Overdiagnosis often reveals extra details that play no role in the onset and progression of the disease, but only desorientiert physician, interfere with accurate diagnosis. No need to save for magnetic resonance imaging, but also to do a survey on a whim – not a solution. Especially when the doctor said that enough to perform radiography. Each method has its advantages in the diagnosis of specific pathologies. Radiography of the larynx – which may show?